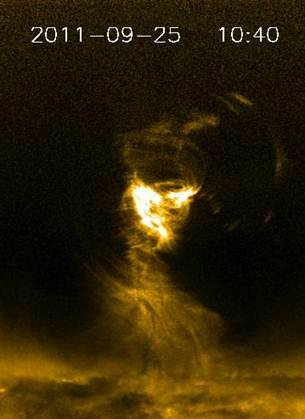 Using the Atmospheric Imaging Assembly telescope, new imagery shows solar tornadoes comprised of superheated gases as hot as 50,000 – 2,000,000 Kelvin on the surface of the sun. Solar tornadoes several times as wide as the Earth can be generated in the solar atmosphere, say researchers in the UK. A solar tornado was discovered using the Atmospheric Imaging Assembly telescope on board the Solar Dynamic Observatory (SDO) satellite. A movie of the tornado will be presented at the National Astronomy Meeting 2012 in Manchester on Thursday 29th March. “This is perhaps the first time that such a huge solar tornado is filmed by an imager. Previously much smaller solar tornadoes were found my SOHO satellite. But they were not filmed,” says Dr. Xing Li, of Aberystwyth University. The Atmospheric Imaging Assembly saw superheated gases as hot as 50,000 – 2,000,000 Kelvin sucked from the root of a dense structure called prominence, and spiral up into the high atmosphere and travel about 200,000 kilometers along helical paths for a period of at least three hours. The tornadoes were observed on 25 September 2011. The hot gases in the tornadoes have speeds as high as 300,000 km per hour. Gas speeds of terrestrial tornadoes can reach 150km per hour. SDO was launched in February 2010. The satellite is orbiting the Earth in a circular, geosynchronous orbit at an altitude of 36,000 kilometers. It monitors constantly solar variations so scientists can understand the cause of the change and eventually have a capability to predict the space weather. Be the first to comment on "Superheated Solar Tornadoes on the Sun"